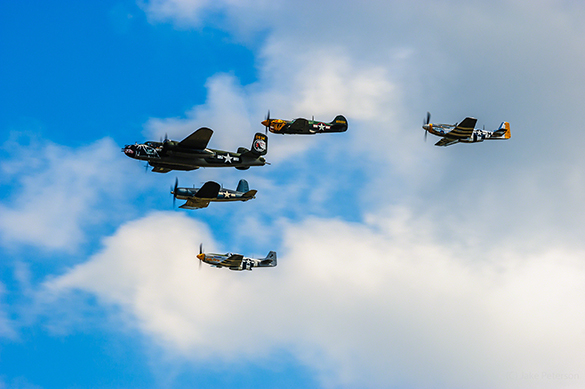 Well EAA Airventure Oshkosh has come and gone once again but the images still remain. While I wasn’t able to go to Oshkosh this year I have been to Oshkosh a couple times in the past and as a result I do know the challenges that come with finishing images that come from Oshkosh. I thought today might be a good day to talk about some very simple techniques to help finish those images. The first thing that you have to realize about Oshkosh is that there is stuff going on everywhere and there are people everywhere. It’s very hard to find clean backgrounds as a result of all of this. With Aviation a clean background is one of the most sought after elements in any photograph. It’s a challenge though because of the distracting elements. With Oshkosh and with such a huge gathering of planes it’s almost more desirable to find ways to incorporate those backgrounds with the images. The re-enactor area sits on the other side of Warbird Alley and is sandwiched between the trainer planes and the speaking area. 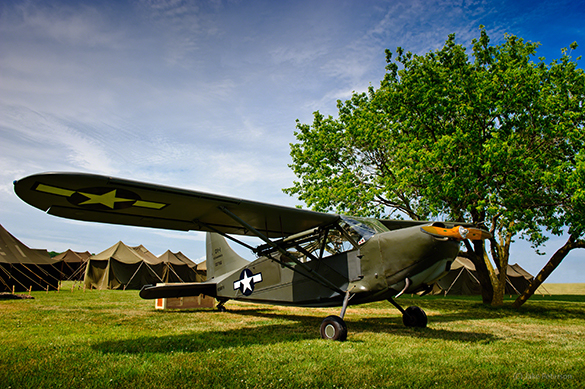 The tents act as a great background because they do bring back some of the feel of how the airfields were setup during WWII. Those airfields were not always luxurious, they often were comprised of a couple of buildings and then a lot of tents. What’s important here is to remove the distracting elements like the cars parked by the tents, the ropes, flags and any other oddity that takes away from the “old timey” feel. While it’s not easy to find clean backgrounds they can be made by merely blocking them out with bigger aircraft. Out in Warbird Alley the number of subjects to work with are endless. It’s easy to overload your senses here and as a result it’s easy to miss shots. One of things that I find helps in these situations is to keep it simple. 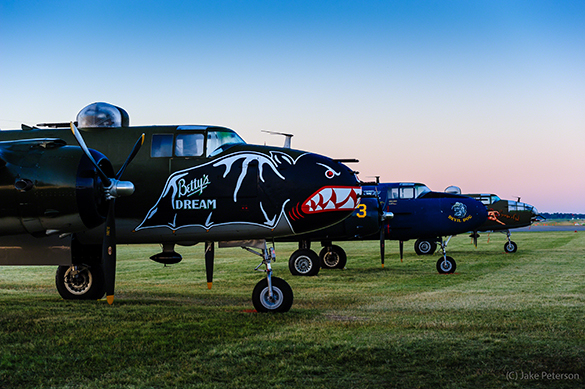 These three B-25’s for instance, Betty’s Dream being the closest, is truly a straight quick shots. In the early morning light the planes looked great after the previous evenings thunderstorm. The drama was helped by adding two graduated filters to the image, one on the bottom to merely darken the grass and bring your eye up and the other up top to bring your eye down by bringing down the color temperature. This gives that cool and darker feel of the morning. Simple steps in ACR that can help direct the viewers eye through the image. Of course it’s not always about the whole picture, there are a lot of tiny details that make up an event like Oshkosh so focusing on those details is really important also. 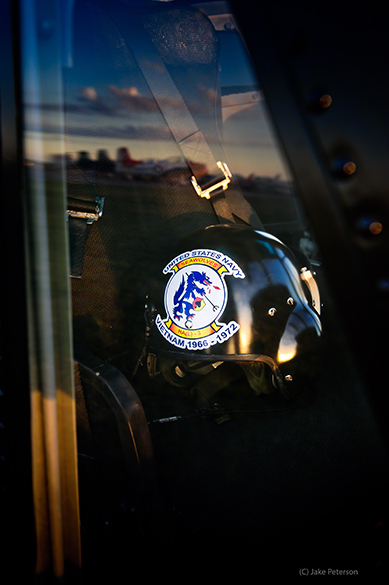 This helmet was sitting in a Huey Helicopter and happened to be one of the responders on scene after the crash at the Reno Air Races back in 2011. The light was coming in through the glass so there wasn’t any reflections from using a flash. Using ACR and the Radial Filter you can essentially add a vignette to bring down the edges and make the more important elements more visible. Vignettes are a great way to get the minds eye to go where you want it to when dealing with crowded areas like these ones. Lastly of course is the flying. There is so much flying going on that you have to be shooting. The one downside of course to photographing planes, especially with prop aircraft, is the amount of dust that gets kicked up. When working with prop planes the other obstacle is getting that prop blur. In order to do so you have to shoot at a low shutter speed which means a greater depth of field. That greater depth of field will show every single spot of dust that you might have on your sensor. If this does happen ACR offers another really helpful tool and thats the spot removal tool. Really simple to use when select hit, go to the bottom and check the box visualize and then you’ll see very dot on your sensor. The best part is after you clean one image you go over to the left and can select all the images and have all those dust spots removed without having to go back over any image. It’s a very handy and time saving tool. Now the great thing about all of these tools is that they can be found in the latest Lightroom as well. This makes it so that no matter what your workflow is you can get your images finished quickly that way you can get back out shooting sooner.